The militarization of police in the US is now even extending into school police departments, as San Diego Unified School District Police are to receive a Mine-Resistant Ambush Protected (MRAP) vehicle as part of the Federal Government’s program to hand down military equipment to domestic law enforcement. NBC San Diego reports that the School police department has been granted permission to take the military vehicle, worth $733,000 in taxpayer money. The MRAP was designed to be used in war zones such as Iraq and Afghanistan to protect troops from improvised explosive devices. SDUSD Police Capt. Joseph Florentino stated that the department intends to use the MRAP as a “Victim Rescue Vehicle,” claiming that the move does not represent a militarization of policing. “We recognize the public concern over perceived ‘militarization of law enforcement,’ but nothing could be further from the truth for School Police,” Florentino noted in a statement. Citing the 1999 Columbine High School massacre, the police Captain argued that the vehicle is needed in case of a school shooting or other hostile event. 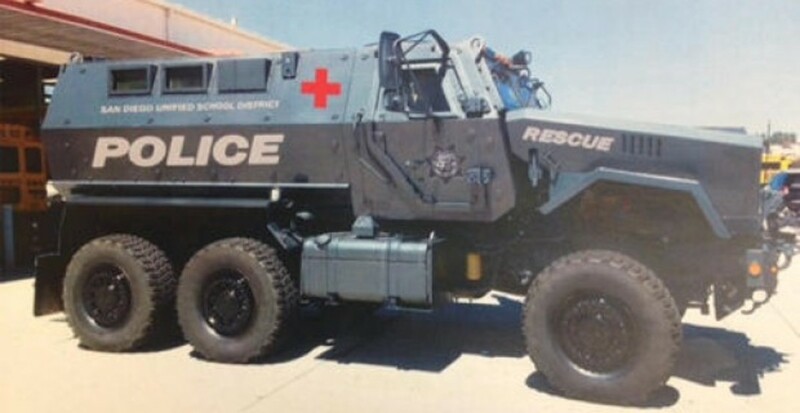 Florentino suggested that in such an event, the MRAP would be used to transport paramedics into “warm/hot zones”, having the capability to literally drive through walls. He also noted that the armored vehicle could be used to help firefighters or other law enforcement departments in emergencies. This is certainly not an isolated incident as far as schools receiving military equipment under the Defense Department’s 1033 program, otherwise known as the Excess Property program. Law enforcement units policing public schools in Texas have acquired tons of used military gear, including M16 rifles, armored vehicles and scores of “high capacity magazines,” all in alleged efforts to keep students safe. Data released by the Pentagon in the wake of the recent uprising and huge police reaction in Ferguson, shows that the government has transferred nearly 80,000 rifles and 1,718 shotguns to counties throughout the US. All in all, it is estimated that $5.1 billion worth of excess military gear has been transferred to domestic law enforcement agencies, and that doesn’t even include similar programs run by the Department of Homeland Security and the Justice Department.